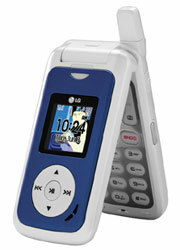 LG Fusic LX550 is a dual-band clamshell music phone with built-in media player as well as a microSD memory port. It can carries a lot of mp3s and songs just like a portable music player, with added ability to listen to songs in stereo sound with a Bluetooth headset or by transmitting the music to an FM receiver. LG Fusic is also a portable media Player with external controls & customizable equalizer, and supports media format of MP3, WMA, AAC, 3GPP, 3G2, & certain MP4. LG Fusic features 1.3-megapixel camera, FM transmitter, EVDO connectivity for media streaming, Bluetooth with Z2DP and a changeable faceplate. IGN reviews LG Fusic (LG LX550) and concludes with overall rating of 8.2 out of 10 that when it comes to a multimedia handset, the FUSIC does a great job handling a variety of functions. Everything from music to video is handled pretty darn okay, and the ability to have nice sound quality when listening to music is a definite plus. The call quality is clean enough, but it won’t be wowing anyone for reception excellence. To make up for the calls, the FUSIC has got to be the best phone on the market for data transfers; surfing around the mobile web and downloading various songs and applications are their fastest speeds yet. LG’s latest is certainly a solid choice for anyone looking for something that has a few extra frills.